Foodie Christmas Package in May! Have you ever experienced a foodie Christmas? I have! I joined a group through the blog website called, The Lean Green Bean that pairs you up with people from around the United States and you send a foodie pen pal package to someone and then someone else sends you a foodie pen pal package. If you think it sounds odd, you're mistaken, it's AWESOME! The basics are, you sign up at Lyndsay's site - on her Foodie Pen Pals Information Page (click here to take you to the page) by the 5th of each month. Then you get an email spreadsheet detailing all the people in that month's Foodie Pen Pal Swap (Like my food swapper events, but via the mail I suppose!) The spreadsheet has all the participants listed along with their blogs/websites and email addresses. You cross reference your name to the person to whom you are sending a package. You contact the person, find out their dietary restrictions, food likes and dislikes, etc. and then you have until the 15th of the month to send out a "care package." The spending limit is $15 - though I know I spent well over that and I'm guess the person who sent me my box spent way more than $15. 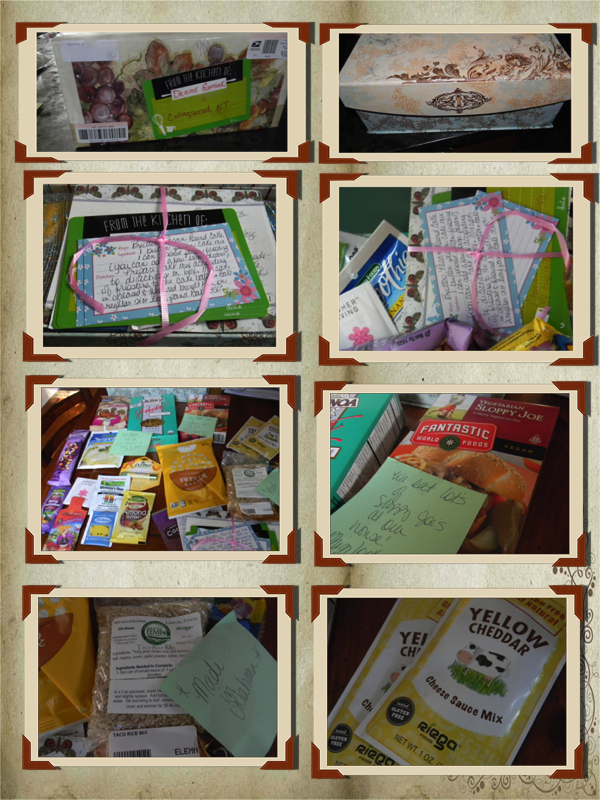 I sent a box of love and goodies to Mike, a military man who lives out in California. He called my package a foodie Christmas - so I'm borrowing the term from him! I sent him local products - Momma's Homemade Apple Pie Applesauce; Dill Pickle Pop Corn from my popcorn store in C'wood; Fleur de Sel Caramel from Market Day Cannelle; Olive Oil and Balsamic Vinegar from Blue Moon in C'wood; 2 of my spice blends; my favorite Korean sesame/coconut crackers; and Goldenberg's Peanut Chews, to represent Philly! I also wrote him a little note, on a Phillies Phanatic Card, and sent him one of my recipe newsletters. notes and gave me blank recipe cards to use too. The box is a magic box of happiness. I've been enjoying the contents for almost 2 weeks now. Plus, the box itself is pretty - I can reuse it for recipes or crafting supplies. My foodie Pen Pal is Karen G, from Oklahoma. She writes a blog called KraftyKJ.blogspot.com - My Jungle of Life in Oklahoma. Karen and I are not even opposites, were are worlds apart, but somehow through this exchange and our emails, I realized that we are not so much worlds apart, we are spirits in different lands who found each other. Karen in her mid-40's; the mother of 3 sons, all teen agers. Her husband is an oil field driller. They live in a small town called Rush Springs, in rural Oklahoma (thankfully, not in the path or affected by the recent devastating tornadoes that swept through Oklahoma a few weeks ago). I thought it fascinating that I got to "meet" and connect with someone from a small town in the middle of the USA. I think of us as living in a small town here in Collingswood, NJ. Ha! We have 15,000 people here! Karen and I traded a bunch of emails and I suspect we will continue to write to each other. I love the idea of sending real mail and packages to people - maybe it's my age or upbringing, but I love to send letters and cards to people. In our age of immediate electronic communications, the art and niceties of taking the time to write, to create, to send a piece of yourself to someone is timeless. What I also learned about this experience is that sharing and caring is universal. I was worried to tell Karen that I'm a gay woman, raising a son, with my partner. I thought maybe Karen would be taken aback by who I am. So much for me being open-minded. She turned out to be the open-minded and brave person. She shared with me that she was going to a gay pride event in Oklahoma one weekend recently! We may come from different worlds, do different jobs, pray at very different churches, but when it all comes down to the basics, we are raising our families, caring for our loved ones, praying for their safety during horrendous storms. We blog and write because it's our creative outlet and connects us to people all around the world. Food and writing, for me and perhaps for Karen G., are the things that we we do to show our love. To participate in a foodie pen pal swap, go to Lyndsay's blog - The Lean Green Bean and check out her page - Foodie Pen Pals Sign up on the List to join in - by the 4th of each month. On the 5th of the month, you'll get an email with the spread sheet and the conditions of the swap. You have to follow some simple rules and ettiqute guidelines. The spending limit is $15, and you have to send your package out by the 15th of the month. It's fun! I can't wait to do this again for June! I really enjoyed this experience. Plus, I loved being able to write with you,Karen. Thanks for the lovely box of treats. I hope the storms pass and you all are unharmed and unscathed. Blessings!